Mayor Kevin Faulconer’s plan to encourage developers to build more homes for middle-class residents is now on hold. The postponement followed concerns from unions and affordable housing advocates that the proposal wouldn’t serve the middle-class San Diegans it’s intended to benefit and that it could hamper efforts to build homes reserved for low-income residents. 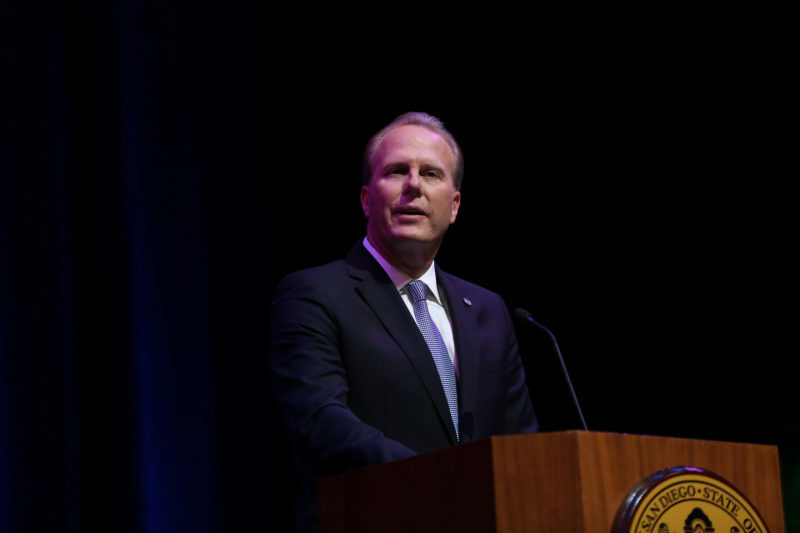 Mayor Kevin Faulconer’s plan to encourage developers to build more homes for middle-class residents – a centerpiece of his proposed housing reforms – is now on hold and will likely see substantial changes before it re-emerges. It had been set to go to the City Council last week. The postponement followed concerns from unions and affordable housing advocates that the proposal wouldn’t serve the middle-class San Diegans it’s intended to benefit and that it could hamper efforts to build homes reserved for low-income residents. Labor leaders not included in earlier talks about the policy are being brought to the negotiating table – which they see as an opportunity to advocate for other policy changes. Faulconer’s middle-income incentive, known as the middle-income density bonus, would allow developers to build 25 percent more units than zoning plans permit in exchange for building more homes for reserved for middle-class San Diegans near transit. Earlier this year, Faulconer’s team debuted regulations that would have allowed developers to receive incentives to build homes for families of four with incomes as high as $120,000 – 150 percent of the annual median income. But union leaders and affordable housing advocates argued the middle-income policy should focus on aiding families with lower incomes. They want to lower the income requirements for families to get the new middle-class homes. Union leaders fear the program could undermine a similar program that allows developers to build more units in exchange for reserving some of those homes for people with low incomes. They think those two programs could end up competing, and that developers would end up building more of the more profitable units for middle-income San Diegans. They are also worried that the new projects could displace people now living in low-income housing and have said they think developers who benefit from the middle-income program should be required to incorporate low-income housing into those projects. Affordable housing advocates have also urged Faulconer to focus the program on lower-income residents by lowering the income requirements to qualify for the new homes. They’d like much of the housing to aid families making between 80 and 120 percent of the median income, a sector that’s been dramatically underserved. A family of four in that range makes roughly $73,000 to $95,000 annually. Recently released city permitting data shows homebuilders met less than 1 percent of the city’s need for middle-income housing over the last seven years. City officials agreed to consider lowering the income threshold at a May City Council committee hearing after City Councilwoman Georgette Gómez, who chairs the committee, and others suggested similar changes. The committee voted to forward the regulations to the full City Council without an endorsement. Since then, discussions have started with labor. Tom Lemmon of the San Diego County Building and Construction Trades Council, a coalition of construction unions countywide, said his group has shared its concerns with city officials and that they seemed interested in addressing them. “I think they’re actually trying to figure it out,” Lemmon said. City officials are also considering arguments that city officials should lower the income threshold to ensure the policy helps middle-income San Diegan families least served by the current housing market. David Graham, a deputy chief operating officer who has overseen the process, confirmed that the city may lower the income requirements for the program and will add language to stave off potential displacement associated with new developments. Similar verbiage is included in the city’s density bonus program for affordable-housing developments. “We want to make sure that we’ve made any improvements necessary and we address concerns raised, and we have something the whole council can support,” Graham said. Graham and Faulconer spokesman Greg Block declined to say when a reworked proposal might come to the City Council. Stephen Russell of the San Diego Housing Federation, who has called for lowering the income requirements, said his group had not been involved in recent talks but is happy city officials are considering changes. In today’s housing market, many middle-income San Diegans are living in homes and apartments once rented by lower-income San Diegans, so Russell said lowering the income threshold could help both groups. “If we don’t fill the need of the moderate income of San Diego, we’re gonna continue to have a crisis for those who are most vulnerable among us,” Russell said. It’s unclear how the Building Industry Association, a powerful champion of the middle-income density bonus, might react to potential changes. Matt Adams, the lobbying group’s vice president, said last month that his group was open to lowering the income requirements for the incentive. At the time, Adams said he had not heard of a delay in the City Council vote on the policy or other potential changes to the proposal. Adams did not return messages from VOSD this week. Conversations with labor are likely to extend beyond the middle-income policy. Lemmon and Murtaza Baxamusa, a researcher affiliated with the county’s largest construction workers union, said Faulconer’s team will likely bring on a broader group of stakeholders to discuss other housing policies too. “The issue here is not to proceed in a siloed fashion, on one ordinance at a time, but to look at it holistically,” Baxamusa said. Union leaders including Lemmon are most focused on inclusionary housing regulations, which require developers to pay fees if they don’t build a certain percentage of low-income housing. Labor groups and Democrats, including City Councilman Chris Ward, want to see the city strengthen mandates that developers designate 10 percent of their new units as affordable and increase fees they must pay in lieu of adding those units. The San Diego Housing Commission began studying the city’s policy options following a memo from Ward last fall. Satomi Rash-Zeigler of Build Better San Diego, a coalition of labor and community groups focused on housing issues, said her group is advocating for a City Council vote on bolstered inclusionary regulations by the end of the year though it has yet to discuss them with city officials. The Building Trades Council is a member of the coalition. Graham and Block declined to comment on when the mayor might bring forward new inclusionary housing policies but confirmed that his team is continuing to work with stakeholders on multiple housing policy proposals.